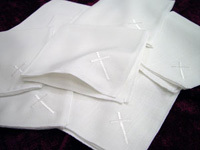 White linen, 12" square, folded twice, with decorative frayed edges and white cross. Can also be used as Communion napkins. Regular price for one dozen napkins is $150.00 Our price: $75.00. Regular price for single napkins is 16.00. Our price: $8.00. 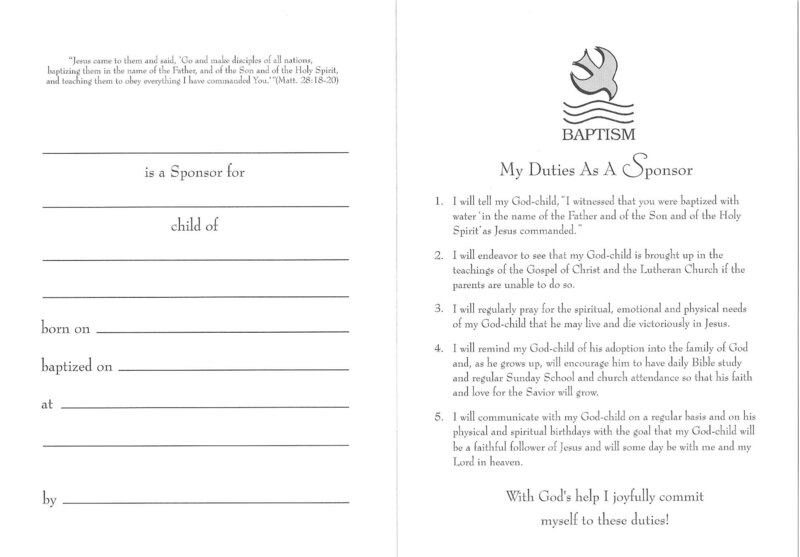 9 1/2" x 7/8" Spaces on box for name of child, date, name of church, address, God parents, and name of pastor officiating. Newsletter--View Current and Past Issues of the Church Press Newsletter. Highlights--View featured stories and products. About Us --Discover the people and background of Church Press, Inc. Contact Us--Address, Phone and Email Address, Return Policy. Links--View a list of Church Press friends and partners.Baptism Supplies--Linen Baptismal Napkins, Baptism Candles, Baptism Certificates (Child), Baptism Certificates (Adult), Sponsor Certificates. Bible Studies--I Have Good News For You, A Time To Laugh or Cry, The Story of Angels, The Many Wonders of Heaven, Unlocking The Mystery of Revelation, The Qur'an and the Bible, A Woman of Value, The Joy of Women's Friendships, The Joy of Hospitality, A Woman's Journey Through Esther, A Woman's Journey Through Ruth, A Woman's Journey Through Luke, A Woman's Journey Through Peter, A Woman of Joy, A Woman of Insight. Cards & Certificates--New Baby Card, Anniversary Card, Membership Certificate, Baptism Certificates (Adult), Baptism Certificates (Children), Get Well Card, Thank You Card, Visitor Card, We Miss You, 10 Card Sampler Set. Church Growth--21 Bridges to the 21st Century, 44 Ways to Increase Church Attendance, Prospect Cards. Church Attendance--Burgundy Vinyl Holder, Burgundy Attendance Pad, Welcome to Our Worship Pens, Blue Vinyl Holder, Blue Attendance Pad, Attendance Cards. Cults--Fast Facts On Mormonism, Fast Facts On Jehovah’s Witnesses, Fast Facts On The Masonic Lodge. Inspirational Materials--Faith Alone, The Soul of The Lion, The Witch, and the Wardrobe, Second Calling, The Frienships of Women, Each Day With Jesus. Islam--The Qur'an and the Bible - A Comparison, Fast Facts on Islam, Islam: Quran vs. Holy Scripture. Marriage--Before You Say "I Do", After You Say "I Do". New Member Class Materials--I Have Good News For You Student Guide, I Have Good News For You (Spiral), I Have Good News For You (Leader's Guide), Good News Audio Tapes & CDs, Video Tapes & DVDs, Good News Bulletin Inserts, Good News Signup Sheet, Good News Poster, Good News Tract Cards, I Have Good News For You - Large Print, Tengo Buenas Nuevas Para Ti (Spanish Edition). Music --The Best of the Best - Full Music Edition, Best of the Best - Lead Line Edition, Best of the Best - Pew Edition, Developing An Effective Worship Ministry, Worship Leader's Handbook, Keys to Becoming an Effective Worship Leader, Sermons Alive! Reproducible Bible Studie--A Bible Introduction, Common Cults, Evolution: Satan's Lie, Government A Godly Perspective, My Marvelous Body, Islam: Quran vs. Holy Scripture, New Age Beginnings, New Age Practices, Reformation and Beyond, The Dark Side, The Early Beginnings. Sermon Books--Preaching Without Notes, Sermons for Special Occasions, Walking and Talking with God, The Apostle's Creed, Joybells of Life, Bought With a Price, No Other Name. Stewardship Materials--Good Giver Folder, Commitment Cards, My Gifts to the Lord Envelope, Good Giver Stewardship Kit, Record of Giving Forms, Coordinating Window Envelopes. Teaching Aids--The Official Sunday School Teachers Handbook, Links, Faith Legacy Series.